Oneida Castle is named for the Oneida Indians who were the first residents. 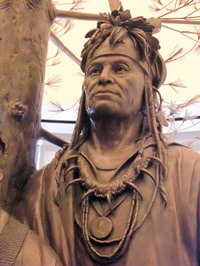 Oneida legend says that the Oneida were led to these lands by following a moving stone; where it stopped, they settled. The name Onyota'a:ka means "The People of the Standing Stone". 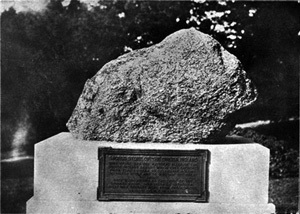 For many years, the Oneida Sacred Stone was in Forest Hill Cemetery in Utica. It was returned to the Oneidas in the 1970's. In 1615, Champlain led an attack against the Oneidas at the Battle of Nichols Pond. Known as the Oneida Castle, it had high and thick walls, hence the term "castle". The Oneidas were well ahead of their time in the field of fortifications. The "castle" included such defenses as a water filled trough that ran through the walls to prevent fire. Champlain attempted to scale the walls and was unsuccessful. He built a wheeled platform and put his rifleman atop of this device. After hours of fighting, the Oneidas defeated the French. Many Jesuit and Protestant missions to the Oneidas were unsuccessful. In 1766, Rev. Samuel Kirkland established a mission in Oneida Castle. Kirkland converted a large number of Oneidas to Christianity. His most notable convert was the great Oneida Chief Skenandoah. It was largely through this influence and friendship that the Oneidas allied with the Americans during the Revolutionary War. For his service to the colonists, Sam Kirkland was awarded a large tract of land (Kirkland, NY). There he established what is now Hamilton College in Clinton, NY. At the request of Skenandoah, he and Kirkland are buried near each other in the Hamiliton College Cemetery. The present Oneida Castle was organized by statue in 1815 and laid out by Surveyors John and William Randel. The map names the village "Oneida Castleton". No one is sure of the reason, but some think it was to distinguish the town from the Oneida Indian Village. In 1841 Oneida Castle was incorporated by an act of the Legislature. The Castle included property south and west of our current boundaries (Madison County). The Act provided that the place be known as Oneida Castle – the ton being dropped from the word Castleton. After the Revolutionary War, the original John Jacob Astor established a trading post here. He lived in a shanty located at the back of where the Village Hall stood. He was the first multi millionaire in the U.S. making his fortune in the fur trading business. Sewell Newhouse invented the first steel game trap in a blacksmith shop that was located at the southeast corner of Rt. 5 and Middle Road. Mr. Newhouse, invented the Newhouse traps at the age of 17 (1823). The spring was made from the head of an ax. Mr. Newhouse sold his traps for 62 cents each. In 1849, Newhouse joined the Oneida Community who manufactured and marketed the traps worldwide. In the mid 1800's, Timothy Jenkins, a lawyer and a member of Congress, tried unsuccessfully to have Oneida Castle designated as the capital of New York State due to its location near the geographic center of the State. Thus the reason for the construction of the Governor's House and the large maple trees that lined State Street. © 2014 - 2019 Village of Oneida Castle NY All rights reserved.